Amazing how different those MMs are! One looks very close to the FM and the other more like a Toyama! Yeah that was my first thought about the Toyama profile too. Looks very similar. Just used my MM tonight to make moose stroganoff. Love this knife! Is that from a moose you took down? Garrick dropped out of the pass around so this is who we have left. Thanks for updating the list, Jeff! It performs 90-95% as well as a FM. My personal copy has a different profile, but the passaround model is nearly identical to my FM. If you really want a FM but can't find one or don't want to wait, BUY THE MM!!! I just had an FM come by on a passaround, and I was very close to being blown away. What you're saying here might just push me over the edge. EDIT: I thought those MMs were <$300... they're not. Will have to wait for June b-day. Curious about your opinion on that 5- 10 percent difference. I'd put the difference in performance closer to 0%, but maybe I'm just not as sensitive to subtle differences in grind, etc. They are different, but it's extremely subtle. When I first got my FM I was a little underwhelmed by it but that was only because I got the MM 2 weeks earlier and it's so close. They're both great though. 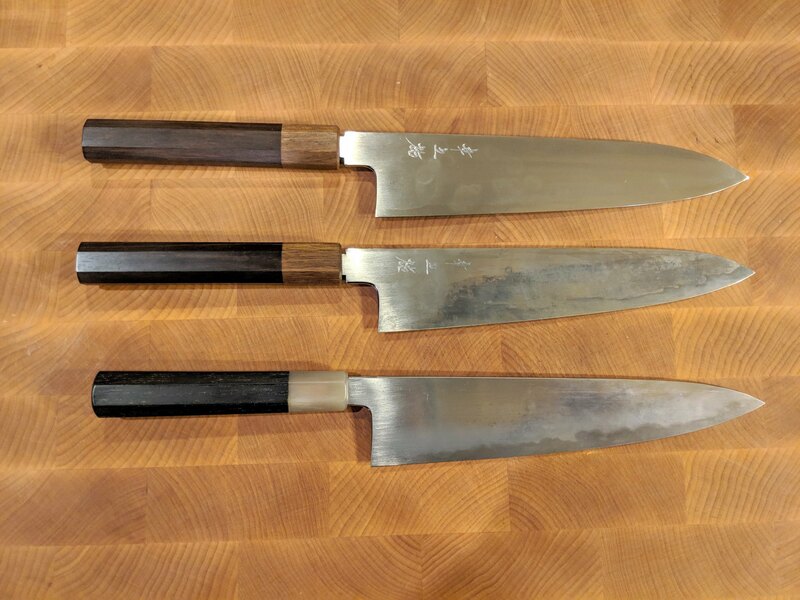 I would warn anyone that, even as performance differences approach 0-5%, these are still different knives that feel different, cut different, and probably serve different needs more appropriately for different people. Just got the MM today. Only used it to cut a couple peppers. Needed sharpened so I put a quick edge on it with my Chosera 800 and 3000. Now it's much better. 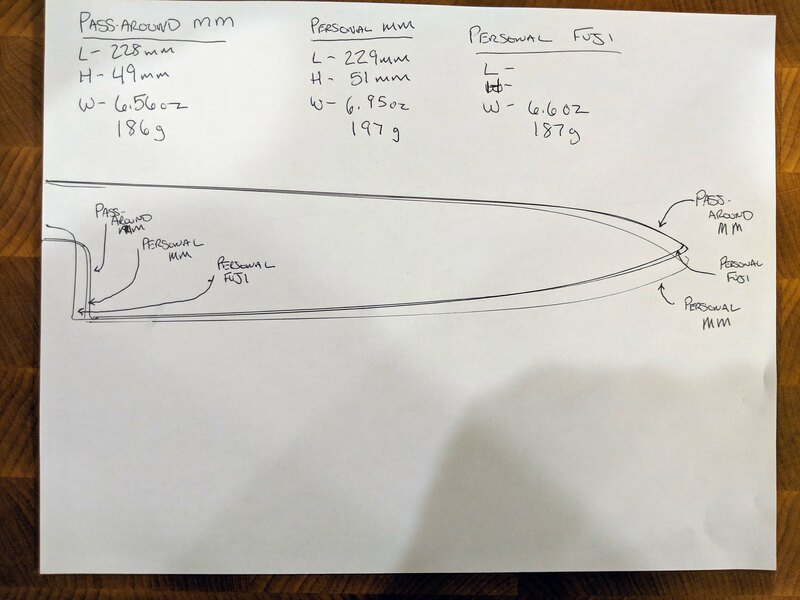 Took some time to compare my own MM and my FM. Comparison doesn't come close to Jeff and Thinman's photos and measurements, but I found it interesting how different the profile of my MM is to the P-A MM. Forgive my terrible handwriting. I was throwing together dinner for the kids and trying to trace the blades and measure them at the same time. You can (maybe) see that the profile of the P-A MM is almost identical to my FM. I expected my MM to look like that but I asked Mark to choose the sample with the tallest heel so I guess that's why the profile is different. Hesitant to use it again because I might sell it. I usually like profiles like this, but I think the way the spine dips towards the tip isn't working for me. I think I prefer the tip to be a little higher. Otherwise it's hella sharp and feels great. My FM & MM are very similar to Ashy’s versions. 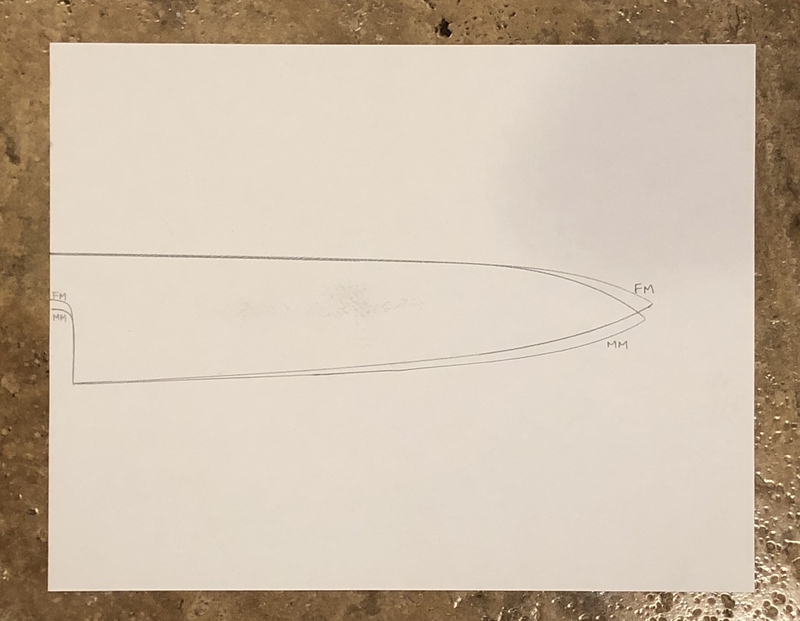 Here is the trace from my personal knives. Since I was the third in line I didn't get a chance to try the factory edge. I still have the original edge on my FM and it's unreal. The passaround MM, even after I sharpened it, didn't feel as good as the FM, but that's not any fault of the knife. With a good sharpening I'm sure it's every bit as good as a FM. They're so close, anyone on the fence should jump on the MM and, if it works for them, enjoy it and not worry about the FM, unless they're dead set on trying one. The knife is now in my posession and in perfect condition. I, coincidentally, nor not so coincidentally, also have the FM on passaround. I hope to put both through a workout this weekend and make some comparisons. It seems like alot of us also have the fms on the passaround, which is pretty cool and can be useful, informative. let him impart to him that hath none; and he that hath meat, let him do likewise." OK gents, as per forum rules, no politics and no religion! That is neither religion nor politics...that is socialism! Last edited by gladius on Thu Dec 06, 2018 9:31 pm, edited 1 time in total. Wait...isn't that Shakespeare in the Park?